Book Review: John Kotter on Change Management | Think Differently! John P. Kotter is a leading author and authority in Change Management. This article is a review of Kotter’s excellent work on the management of change outlined in his books Leading Change and The Heart of Change (with Dan Cohen). I will first summarise Kotter’s model of change in these books, and then assess Kotter’s model critically in relation to several other prominent frameworks for managing change. John Kotter joined the Harvard Business School faculty in 1972. In 1980, at the age of 33, he was given tenure and a full professorship. Professor Kotter is presently Konosuke Matsushita Professor of Leadership, Emeritus at Harvard Business School. According to promotional material for Professor Kotter’s seminars, his articles in The Harvard Business Review over the past twenty years have achieved one of the highest levels of demand for sales of reprints of the articles of any HBR author, and his books are in the top 1% of sales from Amazon.com. The first stage amounts to ‘disconfirming’ the status quo. The case needs to be made that the current arrangements or performance are not ‘good enough.’ The case must be established that change is needed – and needed now. The third stage is about setting a clear and appropriate direction to orient and guide the change efforts. Arguably, the third stage should start before the second stage and be developed in conjunction with it and with the first stage – the guiding coalition should help set, validate and elaborate the strategy but there needs to be some initial idea of the nature of the change and the general approach and strategy before building the initial guiding coalition. The second, sixth, seventh and eighth stages are about building momentum for change and consolidating it to enable further progress in achieving change. Kotter argues that it is not possible to bring everyone on board for change at the same time: instead, the optimal approach is to start with a small team committed to the approach and perhaps a small pilot project, to build momentum and achieve initial successes to gradually bring other stakeholders on board. It is important to generate and celebrate visible wins and to consolidate and reinforce the achievements of change when they do occur. A maxim of change management is that messages about change can almost never be over-communicated, and Kotter’s fourth stage makes this point. Kotter argues that it is better to over-communicate change than under-communicate it. The change messages must be communicated both rationally and in terms of powerful symbolic changes demonstrating management’s commitment to and embodiment of the new approach. Finally, change needs to be embedded into the operating processes and procedures and the culture – “the way we do things” of the organisation. Kotter’s elaboration of each of these 8 stages of change in 8 successive of the chapters of his book provides an informed and interesting discussion of different aspects of managing change. There are a range of useful and perceptive insights, for example into tools for building a sense of urgency in the first stage. That is, emphasis should be shifted from an ‘old paradigm’ of “Analysis-Think-Change” to a new and more effective paradigm of “See-Feel-Change” (pp. 8-13). It is worth noting that similar frameworks to Kotter’s 1995 8-stage framework were introduced previously, for example the 1990 7-stage framework presented in the article “Why Change Programs Don’t Produce Change” by Beer, Eisenstat and Spector, also published in the Harvard Business Review (November-December 1990 issue), or the 1992 “Ten Commandments of Change” framework proposed by Kanter, Stein and Schick in their book Challenge of Organizational Change . The similarities between the two prior frameworks highlighted and Kotter’s framework indicate that there was good work on the management of change along the lines proposed by Kotter well before Kotter’s publication. 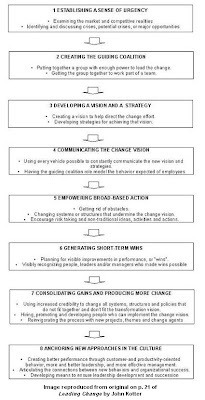 In examining the influence of Kotter’s 8-stage framework for managing change, it is worth noting that Kotter himself attributes his 8-stage framework’s success firstly to the issues addressed in his framework resonating strongly with executive’s experiences and the problems they face in implementing change in the workplace, and secondly to executives finding the eight-stage roadmap “compelling” to help people “talk about transformation, change problems, and change strategies.”Given that Kotter’s framework is much better known today than Beer, Eisenstat and Spector’s framework (Beer and Nohria’s work on Theory E and Theory O published in their HBR article “Cracking the Code of Change” is however very widely known) or the “ten commandments” model indicates that there is the possibility that the simplicity and accessibility of the framework in a simple review in a prominent journal, followed by the book and fieldbook, may have along with the resonance of the issues raised with management experience been significant factors in achieving the high levels of adoption and influence. Many interesting questions were left unanswered, especially about how people more specifically achieved what was described in the book.
. . . while the book is long on the “what” of leading change, it is short on the “how.” It tells me what needs to be done, which I essentially already knew . . . but it doesn’t tell me specifically how to go about doing it. The proposed 8-step change program . . . is a great framework or skeleton. In this case, I would have liked to see some more meat on the bones. A second concern lies with the listing of 8 stages. Do these stages always need occur in every change effort? Do they always need to occur in the same order? It is by no means clear to me that this should be so. For example, you might want to begin forming the vision before selecting the guiding coalition (as proposed in the Beer, Eisenstat and Spector framework above), so that the right people can be selected for the guiding coalition, who will then be on-board for the change program. Listing eight steps in planned change could encourage leaders to adopt a check-off mentality–“We’re just now finishing step three and moving into step four.” That mentality oversimplifies the process and fails to recognize the both the complexities and the interdependencies of planned change. From the point of view of assessing Kotter’s view of managing change, it should be noted that the Kotter model is focused on the organisational activities initiated to bring about change. It sits, so to speak, at the mountain-top, and does not descend into the valleys to describe in a detailed manner the process of helping individuals work through the psychological process of change, moving them from possible resistance through to active commitment. By covering the need for communication, the removal of obstacles to performing the changed processes and activities, and the need to reinforce change by realigning organisational incentives, Kotter covers much of the content desribed in, for example, the the Prosci ADKAR model in his framework. However, the reader needs to move beyond the high level framework and into the content of the discussion (e.g. see Exhibit 3 on p. 115) to find this articulated clearly and it is not pur forward as simply and forcefully. Kotter does not go into the detail of the psychology involved in managing change covered in alternative change models such as the Bridges model of Managing Transitions or the Jellison J-Curve approach, in which individuals need to move through letting go of the past, move through disorientation while learning new approaches, skills and behaviours, and confronting the temporary ‘dip’ in performance and effectiveness as they move away from old ways that they have optimised and begin to gain familiarity with the new and ultimately more effective activities, behaviours, roles and identities. This possible weakness is addressed to some extent in the follow-up book The Heart of Change as this work undertakes a more serious attempt to look at a broad range of case examples as Deloittte’s research team, headed by Dan Cohen, interviewed over 90 U.S., European, Australian and South African organisations (all Deloitte customers) about their experiences with the management of change. The Kotter model of managing change is a useful framework for orienting change management activity, but rather than treating it is a standalone model that covers ‘everything we need to know about the management of change’ it is useful to regard it as a model that is complementary to other approaches to the management of change such as the William Bridges model of managing transitions and the Jellison J-Curve approach. In approaching change, it is useful to combine the insights from these models of change into one integrated approach. In summary, the Kotter model for managing change introduced in Leading Change remains one of the most highly regarded and useful frameworks for managing change. However, while it is a useful framework for orienting thought and activity, it may not be productive to attempt to use it as a hard and fast proscriptive process or methodology for managing change. The stages outlined – and the order the stages are addressed in – should be adapted by change managers to suit the change tasks on the ground. In practice it may frequently be useful to combine Kotter’s framework for conceptualising and organising change management activity with some of the other leading change models which engage more closely with the psychological processes of change that individuals have to go through when they are asked to move to new behaviours, activities, roles and identities in an organisation, such as the insights presented in complementary change management models such as the Bridges model of Managing Transitions or the Jellison J-Curve approach. In the meanwhile, Kotter’s model of managing change remains one of the key tools in the arsenal of change managers, and of consultants educating executive management through the process of change. It is worth reading each chapter of Leading Change in detail to absorb Kotter’s thoughts on the dynamics involved in each stage and understand clearly the flavour of Kotter’s message – and then repeating again with the additional examples and insights in The Heart of Change. At the end of the day Kotter’s framework is useful for orienting action around the change process and anticipating and troubleshooting potential problem areas – and perhaps that is the best outcome we can ask for from a Change Management tool.